What Car magazine have launched a valuation app for iOS, Android, Windows Phone 7 and Nokia. The app allows you to get second hand valuations for your car, broken down into dealer price, trade price, part exchange and private sale. What’s more, these valuations are free. You can also look a target price for new cars and save cars to your virtual “garage”. What Car’s ratings for each car appear when you do a search and the whole experience worked rather well for us on iOS and Android. What Car? has launched the UK’s ﬁrst free car valuation app, bringing What Car?’s 39 years of independent expertise to car buyers and sellers on the move. The app developed by Grapple, the UK’s leading mobile innovation agency, is available on iPhone, Android, Nokia, and Windows Phone 7. For the ﬁrst time consumers will be able to access the UK’s most trusted automotive advice any time, any where. The free ‘What Car? 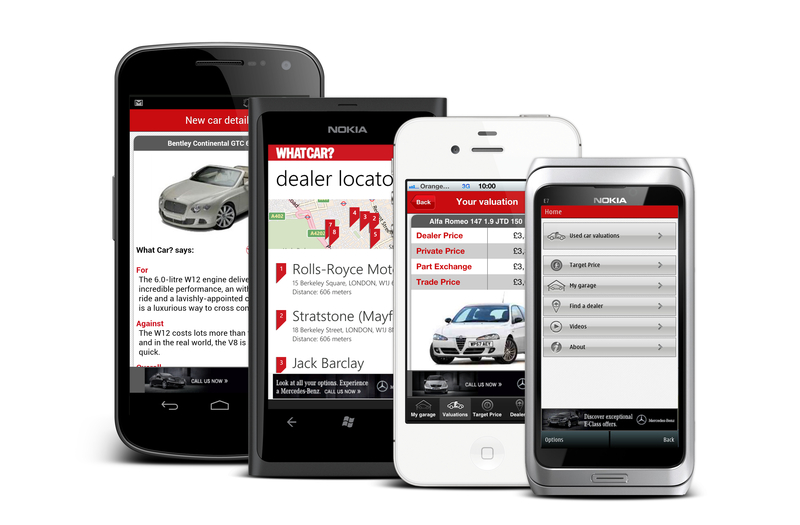 Valuations’ app provides not only car valuations, but also expert opinions, and dealer location tools free of charge. The ‘What Car? Valuations’ app empowers customers with all the information they need to secure a good deal at their ﬁngertips, for example in a showroom or used-car forecourt. • Used-car valuation – consumers can ﬁnd an accurate valuation by entering the make, model, bodystyle, version, year and mileage of the car they’re looking at. The app breaks down valuations by dealer price, private price, part-exchange, and trade price. • New-car valuation – it’s easy to ﬁnd an accurate list price for each model, and a What Car? Target Price, which shows an achievable discount on that car. • What Car? independent expert advice – the app contains What Car?’s expert opinion, our universally trusted and acknowledged star rating, plus reliability ratings. • View similarly priced cars* – for every car model at a ﬂick of the wrist by turning the handset from portrait to landscape. • Find the nearest dealer – for searched models, based on current location using GPS, or by postcode. • Save cars to ‘My Garage’ in app – enabling quick and easy viewing at a later date.